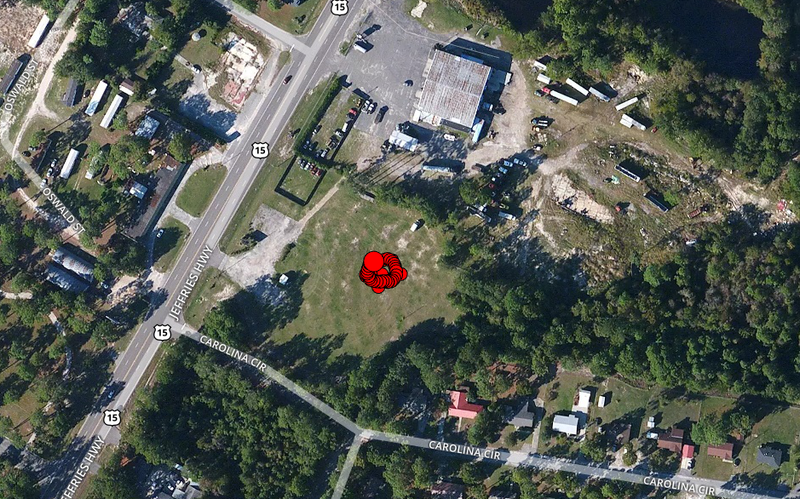 The image above shows a reconstruction of a crash site, deliberately staged for training fire and emergency response rescue teams in South Carolina. The site is used for training how to rescue trapped accident victims from inside their vehicle after a crash. For this project, 69 digital images were captured by a DJI Phantom 3 Advanced UAV carrying a FC300X digital camera, flown in a circular path over the crash site by Tom Fernandez of SkyView Aerial Solutions. The aim was to generate a 3D point cloud and 3D model covering the survey site just from the series of oblique images taken along the flight path, without prior knowledge of the geometry. The Pix4D Mapper application was used to then process the images and reconstruct the full 3D environment in a digital scene, including a tiled and progressive level of detail (LOD) mesh. 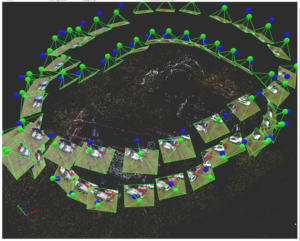 The actual digital photos that formed a complete 360° aspect site were assembled, analysed and calibrated using advanced photogrammetry 3D image reconstruction algorithms to reconstruct a 3D geometric virtual reality capture and build a 3D mesh model representation, before being exported in OBJ with a high-resolution texture image resource. To enhance the model further, it was converted to 3D PDF using PDF3D ReportGen with the MS Office Plugin as the basis of the page layout. The OBJ was processed using texture image segmentation, with encoding into PRC highly-compressed tessellation, which generated excellent image quality within a much smaller file size (The 3D PDF resolution is equivalent to 8k x 8k RGB texture). What was initially an 86Mb OBJ+JPEG file (generated by PIX4D) becomes a 20 Mb 3D PDF after ReportGen conversion. 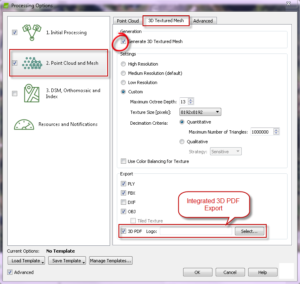 For simple one-click reports, the 3D PDF can be exported directly out of Pix4DMapper without leaving the menus or involving any other external programs, as part of the reconstruction process. Measurements on skid marks and vehicle placement and annotations can be made directly on the 3D PDF view to support legal team reviews and evidence presentation. Pix4DMapper has integrated built-in easy to use 3D PDF export, using the PDF3D-SDK engine, which means that the 3D PDF can be exported directly out of Pix4DMapper, as part of the reconstruction process, in just one click, by checking the “3D PDF” box and inserting a custom logo. 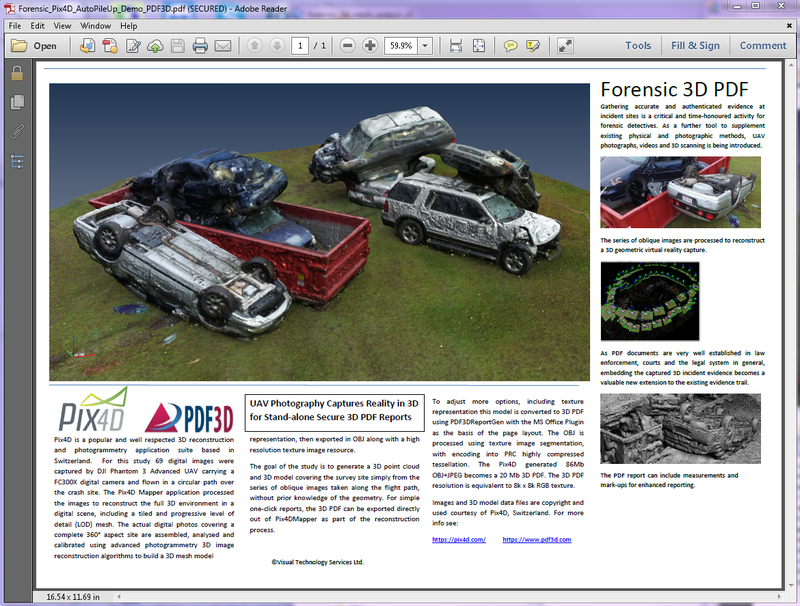 For the background on the crash site project see the Pix4D case study. 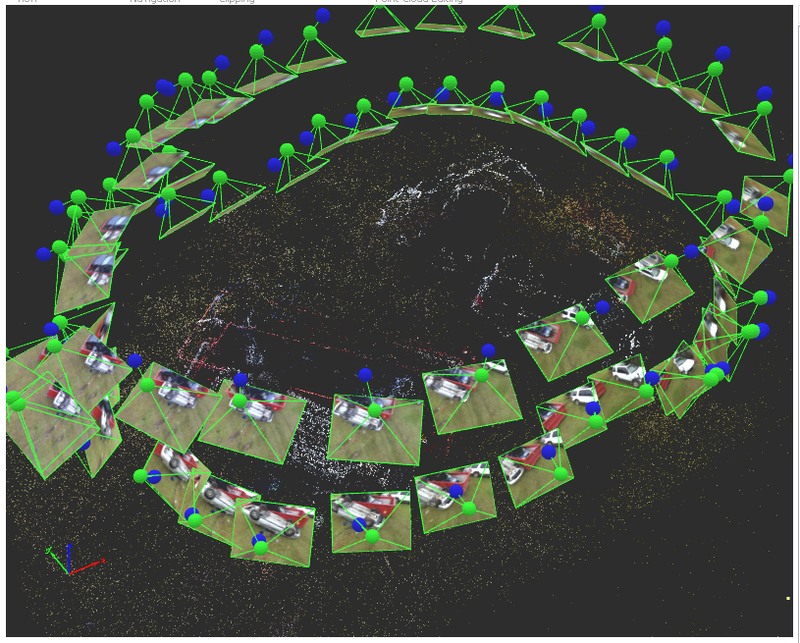 Alternatively, as shown in this study, the mesh data can also be post-processed using PDF3D ReportGen to offer more report generation options and configurations, such as referencing a report template and adjusting the texture processing for higher visual quality. 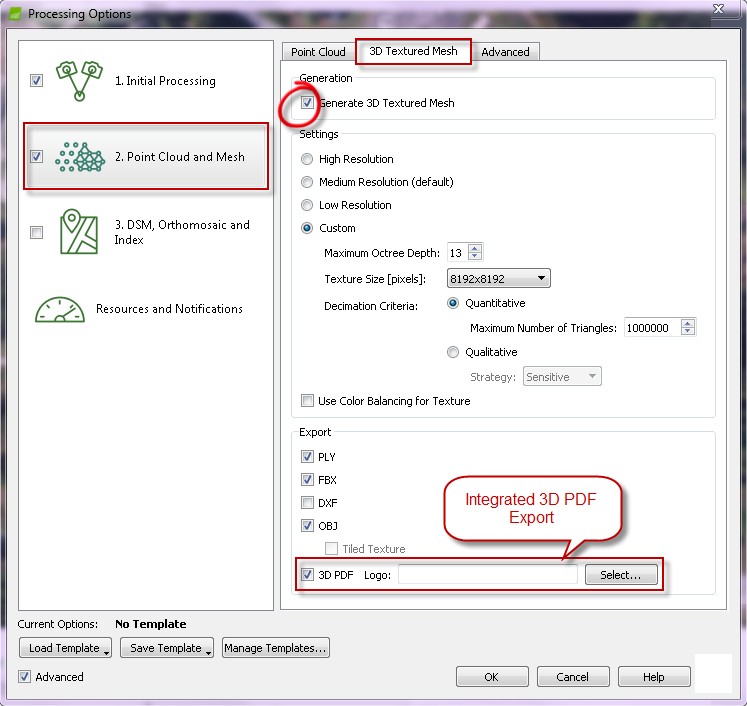 You can learn more about 3D PDF conversion using ReportGen here. 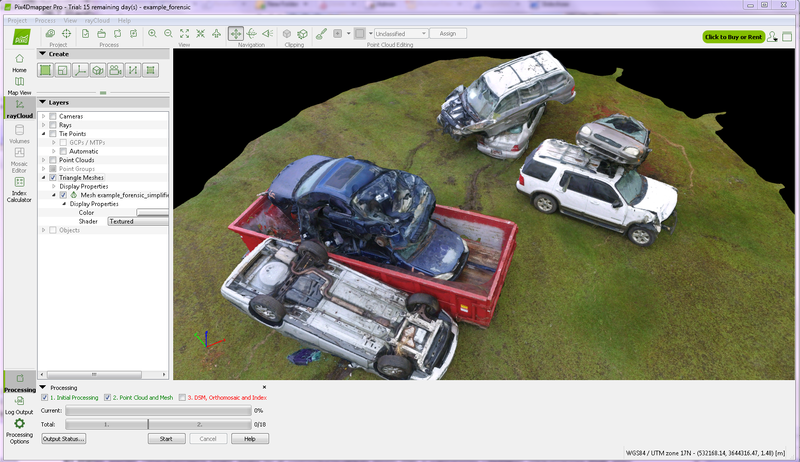 Images and 3D model data files are copyright and used courtesy of Pix4D, Switzerland.